From Wikipedia A teen or teenager is a person between 13 and 19 years of age. From Wikipedia Investigation is the process of inquiring into a matter through research, follow-up, study, or formal procedure of discovery. May 11, 2009 - PRLog -- Teen investigations are unique and at times a very sobering experience for the entire family, but becoming more prominent and necessary. Providing peace of mind through discreet investigations of your teen to verify their activities can save their life. Things are much different for teenagers growing up in 2009 the last year of the 2000s decade versus previous decades. Drug use, gang activity, shoplifting / theft, school shootings and violent attacks on fellow students are common headlines in the news today. I would have never imagined these headlines being so common. These alarming stories are not limited to just inner cities but have spread throughout our country and impact us no matter what corner of the United States we live in from rural farm lands like Lancaster, PA to New York City and Los Angeles. We all need car insurance, home owners insurance and health insurance. So, why would you not want to insure your child? Having a teen investigation conducting when there are red flags being waved to verify and identify what is taking place with your most valued possession, your child, should not be overlooked or ignored. What is he/she doing and with whom? Making the decision to investigate your child is not an easy one, but in the grand scheme of things, this decision is small but larger than life.  Disappear for hours at a time?  Hanging with the wrong crowd?  Discreet or excessive computer use?  Is your child acting different or strange?  Is your teenager dating and or involved with an older adult?  Does the mileage in the family car match up to places he/she was supposed to be? Now is the time to identify when your teen is making poor judgments or unethical decisions before they make that final turn into gangs, drugs and other violent and dangerous activities. When conducted before it is too late, teen investigations can save your child’s life. Parents have the right to know and protect their children, insuring that their safety and well being today will provide a lifetime of happiness tomorrow. ELPS PDA serves legal firms, businesses and private citizens, providing quality results in a timely fashion. Our firm is committed to you, our customer, and we pride ourselves on being results oriented. 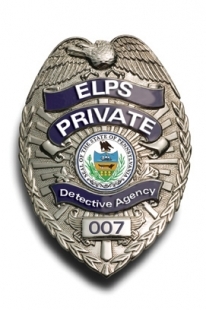 ELPS Private Detective Agency handles all investigations in an energetic and efficient manner. The company strives to be responsive to the needs of our clients with professionalism and courtesy. When you have a need for an investigative agency that can deliver, please call us. We look forward to providing you with the investigative services you require.